Contactless is the quick, easy and secure way to pay for your bus travel, and there are two ways to pay using contactless. Just tap on at the start of your journey using your contactless card or device, and tap off before you leave. Simple. You'll be charged a single journey for each trip, and with our day & 28 day cap in place your fares will be limited no matter how often you travel. You can also use your smart devices to travel contactless. You'll also be able to make contactless payments when purchasing any tickets or Kinchkard up to the value of £30. Instead of paying with cash, you can pay with contactless by telling the driver which ticket you want, then placing your credit or debit card on the reader of the ticket machine as payment. We also accept contactless payments on smart devices. All Visa, Mastercard and Maestro credit and debit cards with the contactless symbol can be used, including most contactless cards issued overseas. Payments can also be made using a smart device via Apple Pay or Android Pay. Unfortunately, we’re unable to accept American Express cards at this time. 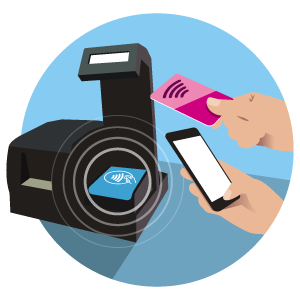 Yes, you can travel contactless or make contactless payments on smartphones and smartwatches using Apple Pay and Android Pay as well as contactless enabled wearables such as wristbands. You can buy any tickets up to the value of £30 on skylink Derby services including single, return and day tickets, as well as buying or topping up Kinchkard up to £30. Visa and Mastercard have set the national limit for contactless payments in the UK to £30 and therefore we are not able to process contactless payments over this value. This £30 limit also applies to contactless payments on smart devices. Do I still get a ticket if I pay with contactless? If you travel contactless, by just tapping on and off as you travel, you won't get a ticket. However, you can still check your fares and journey history with your contactless card through our website. If you make a contactless payment to purchase a ticket or Kinchkard, or top-up your Kinchkard then you will be provided with a ticket and you’ll also receive a separate small contactless payment receipt along with your ticket. Yes, for contactless payments you’ll receive a separate small contactless payment receipt along with your ticket. If you travel contactless, by touching on and off as you travel, you won't get a receipt. However, you can still check your fares and journey history through our secure webpage. You'll need to enter the card details you used for travel. Yes, your card can be used more than once when making contactless payments. If you need to buy different types of tickets you can add these together and pay for them in a single transaction, as you would with cash. If you want to buy several tickets that add up to more than the £30 limit, you can buy these separately using your card for each transaction, however please keep in mind that your bank or card-issuer may impose limits on how may contactless transactions can be carried out before a chip & pin authorisation is required. However, if you travel contactless, by touching on and off as you travel, you can only use your card for your own journey. Yes you can. Also, if you’re both travelling at the same time, you can use each card separately for contactless travel or contactless payments. During a contactless payment transaction, only minimal information is sent to us, and no information about your card account or personal data is displayed to the driver or our customer services and finance team. There are a few reasons why a card may not work when presented for travel; if this happens your driver will ask you to try another card, or to pay using cash. Unfortunately, we will not always know the reason for a card not being accepted. 5. Your mobile device has not been set up correctly to use Apple Pay or Android Pay or you are not using the Apps to support the payment properly. 6. Your card has been flagged as not having had a chip and PIN transaction for a certain period. Many card issuers require at least one chip and PIN transaction to take place in every so many transactions, to help manage the risk of the card becoming lost or stolen and subsequently being used fraudulently by criminals. 7. Your card hasn’t been approved by the bank for the transaction. This can happen if you make several low value transactions in a short space of time, as for some card issuers this can trigger risk management rules that are designed to keep your card safe from criminal activity. 8. If you are affected by issues 6) or 7), you may find that your card will be temporarily added to our “deny list.” This will mean that you will not be able to travel until this flag has been removed in our systems. The easiest way to remove this flag is to do the following: Conduct a chip and PIN transaction at an ATM or retailer of your choice and attempt to travel again (for issue 7 it is best to wait until the following day). Our drivers cannot offer refunds for contactless payments that have been completed on our vehicles. If you have purchased the wrong ticket, please proceed to purchase the correct ticket and then contact our customer services team, who will be able to refund the incorrectly purchased ticket for you. Can I top up my Kinchkard using contactless? Yes, as long as the top-up amount is no more than £30. What happens if I forget to touch off when I travel contactless? You will be charged to the final destination of the journey that the bus is making. For instance - if you get on the bus at Leicester and touch on, then get off at Loughborough but forget to touch off, you will be charged all the way to Derby which is the end of the journey. So always remember to touch off. If you do forget, please contact our customer services team who will be able to help. Can I benefit from the caps using different cards linked to the same account? No, each device or card has a unique ID so will only cap to that one account. Can I get child prices through contactless? No, only adult prices are charged on contactless touch on/touch off travel.You can however pay for child tickets with contactless. What happens if I use my mobile device to touch on, but then lose power before I can touch off? You will be charged to the end of the journey, however, if you contact our customer service team they will be able to issue you a refund. Do I have to have a cellular or WiFi signal to use my mobile device for contactless? No, don't worry. Our ticket machines will communicate with your bank/card issuer. Our customer services team are ready to help. How do I check my journey history if I travel contactless? You can check your journey history for the past 90 days on our secure webpage. You'll need to enter your card details that you used for travel.